As the National Hockey League locks out its players this season, teams have struggled to remain connected to their communities — just as fans of all ages have struggled to remain engaged with the game as the arenas are dark. Last week, the Nashville Predators did something that broke through the gloom of the lockout. 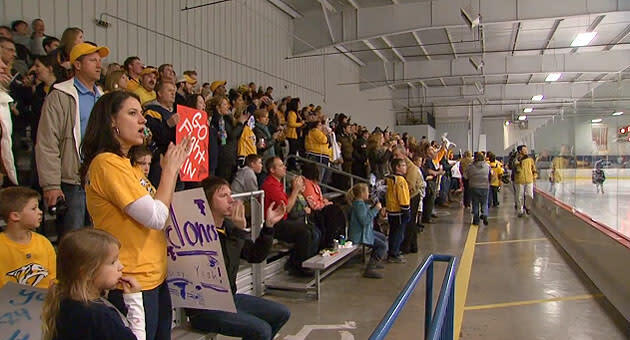 The Preds invited 250 people to the A-Game Sportsplex in Franklin for what the team called a "pizza party." Only it wasn't a pizza party — it was a surprise that two Nashville Jr. Predator hockey teams were never going to forget. As the youth teams, the Cyclones and Blizzards, warmed up, the yellow-clad Predators fans filed into the metal bleachers. Drummers pounded away as cheerleaders and Gnash, the team's mascot, appeared. Paul McCann, the team's PA announcer, took over the mic for player introductions and announcing. What a night to remember for these players. "I think it was a thrill for the kids," Predators coach Barry Trotz said. "That's sort of what our organization has done. The lockout is not where we want to be, but we're making the best of it and doing some things in the community and it's a thrill of a lifetime for some of these kids." Matt Dunn, a team coach, was actually late to the game with his son. He didn't know of the event until he walked into the rink and saw it packed. "It was an incredible experience for the boys," Dunn said "You could see the adrenaline flowing through them, they couldn't keep the smiles off their faces. They were flying all over the ice, having all that enthusiasm with the crowd noise, it really made it special for these kids." Deadspin picked up the video on Monday, and it quickly went viral. Granted, this was a publicity stunt for a team attempting to keep momentum going in the community during the NHL lockout, after a huge season in franchise history that saw Nashville advance to the second round of the Stanley Cup Playoffs for just the second time. "I'll admit that I was a bit cynical when I heard about the whole thing, but seeing it come together, and how pumped up those kids were to play in front of a full crowd? Well, you just can't beat that..."
No, you can't; and a lockout can't defeat the spirit of the game either.